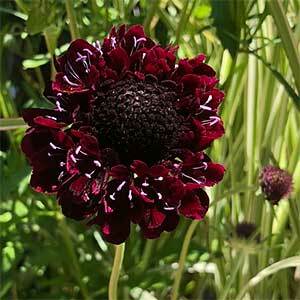 An outstanding variety, Scabiosa ‘Midnight’ with its deep burgundy red to black flowers is a must have cottage garden plant. It does flower late, summer to mid summer, with the flowers taking a while to open. However once they do this is a plant that keep flowering for weeks. As the flowers mature, white stamens will appear to add a great contrast against the deep red. The flowers are very attractive to bees and this easy care cottage garden plant look great when planted beneath roses. One of the best red flowering Scabiosa varieties available. Like most plants, Scabiosa ‘Midnight’ grows best in the ground, it likes good sun and a well drained humus rich soil. It will grow in a container and with its deep red pincushion flowers on long stems certainly makes a good feature plant when in flower. Best grown in a sunny position to prevent it from becoming to leggy. Usually treated as a biennial, in good conditions it will self seed. Position – Part shade to full sun. Flowers – Deep Burgundy red. Flowering time – Summer to autumn. Height – To .5 metre. Root system – Non invasive. Frost tolerant – Yes light frosts. Pruning – Prune back fairly hard in late winter. It can be pruned back a little after flowering to promote more flowers.